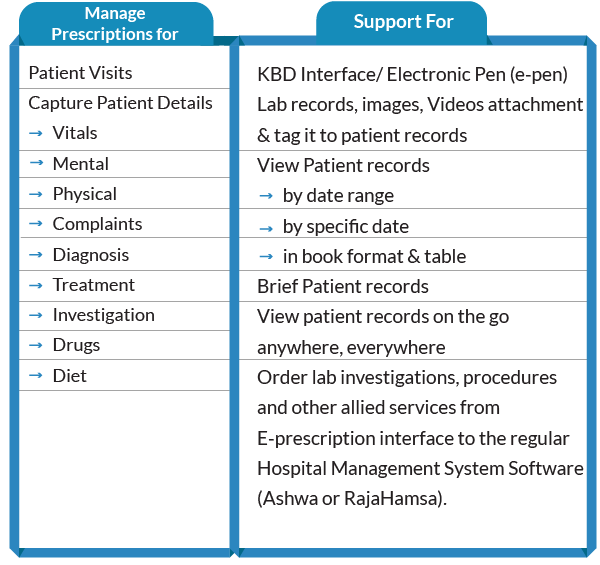 E-Prescription enables doctors and nursing staff to capture and effectively record details about each patient, during every visit, along with details of the ailment, diagnosis, treatment provided and medication prescribed. The solution integrates a digital pen (E-pen) for capturing prescriptions as an image, which can then be attached to the patient's EMR. Electronic Medical Record (EMR) maintains the complete medical history of every patient which can be accessed by doctors and nursing staff through an easy-to-use search interface. Information provided by EMR combines details captured in the e-Prescription interface in addition to generic patient details such as history of diseases, family history, and immunization history. Physical, mental, vitals and chief complaints of the patient. Drug, investigation, and dietary prescriptions. Doctors and nursing staff get to view all details about the earlier encounters record by record. Copyright © 2013 - 2019 Spigot Software Pvt. Ltd. Bangalore, India. All Rights Reserved.